A study released by Public Policy Polling found that even in “red” states, increases to minimum wage are supported, regardless of party affiliation. 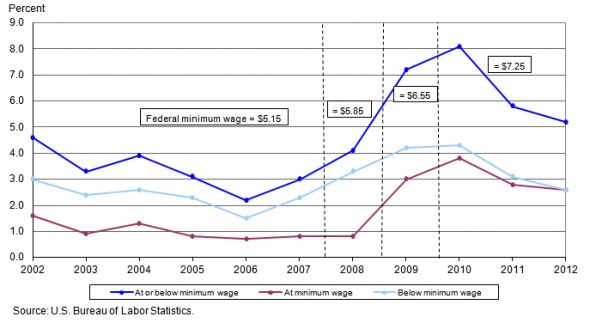 Despite controversy, hikes to minimum wage are gaining bipartisan support. A new study released by Public Policy Polling shows that in at least two deeply "red" states, Georgia and Kentucky, voters favor increases regardless of party affiliation. Furthermore, the organization found this sentiment may become an important factor in Fall 2014 elections. Currently, the federal minimum wage is $7.25 per hour, however, according to the U.S. Department of Labor, several states have set their rates higher, including California, New York, Florida and Washington. Leaders on the right side of the political isle tend to oppose such measures, claiming hikes to minimum wage may hurt job creation, but Georgia and Kentucky voters favor boosting their states’ minimum wages to $10 per hour, regardless of political leaning. The study found that, in addition to overwhelming support from Democrats, the proposed increases have an unusual amount of support from Republicans. 40 percent of Republicans polled in Kentucky and 27 percent in Georgia supported minimum wage increases. Public Poling Policy reports the findings in Kentucky and Georgia mirror what they have found in other red states. Blocking efforts to raise the minimum wage will likely hurt GOP prospects in Kentucky and Georgia’s contested Senate races this fall, according to Public Policy Polling. 42 percent of Kentucky voters said they would be less likely to support Sen. Mitch McConnell (R) for reelection if he votes against increasing the minimum wage, compared to the 25 percent who said they would be more likely to support him. In Georgia, 42 percent said they would be less likely to vote for the eventual Republican nominee if he or she opposes increasing the minimum wage. 30 percent of Georgians polled said they would support a candidate that opposed the measure. Undecided voters in both states favor raising the minimum wage. Public Policy Polling found independent Kentucky voters support raising the minimum wage to $10 an hour by a 25 point margin, and those undecided in Georgia favor the hike by 19 points. Regardless of party affiliation, voters in Kentucky and Georgia agreed that someone who works full time should be paid enough to keep them out of poverty. 79 percent agreed in Kentucky, with 9 percent saying they disagreed. 11 percent said they were unsure. In Georgia, 66 percent agreed, 20 percent disagreed and 14 percent said they were unsure. According to the Living Wage Calculator, a tool designed by the Department of Urban Studies at MIT to estimate the cost of living for low-wage families, the living wage, or the hourly rate needed to maintain a reasonable standard of living, in Georgia for a family of four is $18.55. In Kentucky, the wage needed to support the same family is $17.18. As of 2010, 163,000 hourly-paid workers in Georgia had earnings at or below the federal minimum wage, according to the Bureau of Labor Statistics, accounting for 8.5 percent of hourly-paid workers in the state. In Kentucky, as of 2012, 60,000 workers earned minimum wage or less, or 4.7 percent of the hourly-paid workforce.